We know that getting children to eat any vegetables can be a battle, never mind the recommended 5 fruits and vegetables a day. You should never give up trying but avoid making it an issue either. By encouraging your child to swap high-fat and sugary snacks for fruit you will save money in the long run and really improve their health, mood, concentration levels and immunity. Have a look at the list of nutrient-dense super foods and see if there's anything you could combine together to make smoothies or that might appeal to your child on it's own. 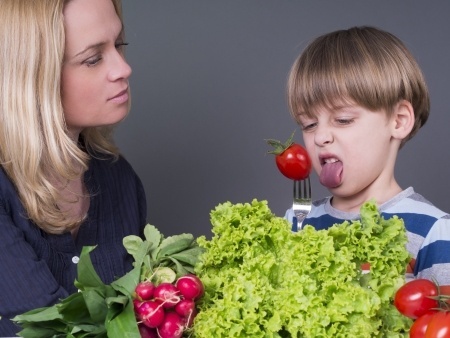 Try these ideas below to get your kids to eat fruit and vegetables. They do require a bit of effort on your part and perhaps some enthusiasm (or bribery) to convince the child of the benefits. If you are going to put fruit or fresh vegetables in a school lunch box then peel and pre-cut into manageable pieces. Disguise vegetables in meals that your kids will already eat. Make fruit kebabs using a variety of colored fruit such as melon, strawberries, pineapple and kiwi fruit which is a super food. Blend fruit into a smoothie by whizzing up a banana with some frozen mixed berries and a dollop of yogurt – this makes a nutritious drink and you can also slowly add a bit of chlorella greens or Barley green to it. Disguise vegetables in your cooking – add pureed carrots to tomato-based pasta sauces and finely chop a variety of vegetables and hide then in homemade pizzas, soups, mince dishes and casseroles. Use fruit as a garnish for your dinner dishes and add chopped up fruit to jelly for a healthier dessert. At mealtimes, draw or create a picture out of fruit and vegetables for younger children – use broccoli for trees, carrots and celery for flowers, cauliflower for clouds and yellow squash for the sun. Grated carrot makes good hair if you are making a face. When it’s done the child gets to eat their masterpiece. If you want to resort to bribery or positive reinforcement, try a star-chart. Encourage children to eat vegetables by give them a star for each portion of fruit or vegetable they eat. Allow a reward or treat when a certain number of stars have been achieved – this is a winning formula in many homes. Vegetable kebabs, baked banana in its skin and corn on the cob are also great treats for the on the barbecue. Lots of children love cheese sauce so maybe this would work. Some moms swear by disguising veggies with cheese. Be aware of the fat intake though. Give it a funky name. Personally, if I was 4 years old, I'd be more interested in eating a fairy garden than a salad. So, make the vegetables fun with a name they would appreciate like fairy’s garden salad, princess pie, pirates picnic, sailor soup with crouton boats….you get the idea. I know some adults who to this day cannot eat a vegetable without tomato sauce so try that too but make it a good quality tomato sauce that's not laden with colorants and additives. In desperation for my 4 year old to eat a carrot I told her to pretend there was a bunny in her tummy that needed a carrot. She was a bit suspicious but it worked. Different fruits and vegetables contain a multitude of enzymes and micro nutrients essential to a child’s growth and development especially in a raw food diet. Brightly colored fruits and vegetables such as cling peaches, pawpaw, apricots, butternut, pumpkin, carrot and spinach are predominantly rich in Vitamin A, while citrus fruits and green leafy vegetables can substantially boost a child’s intake of vitamin C and other essential nutrients. Fruit and vegetables are also rich in fiber which is important for healthy bowel functions and reduces the risk of several diseases including heart disease and cancer. Children love to imitate, so be a positive role model. If they see you happily enjoying a variety of fruits an vegetables everyday with enthusiasm then they are more likely to eat them too.